During his high school years he worked at the Flamingo Resort, an iconic hotel in Santa Rosa, performing in a variety of positions as a part of the restaurant staff. During the spring time he would help care for the small finches and blackbirds that fell from their nests high up in the palm trees on the hotel grounds. Uncle Scale worked at the hotel up until his move to Southern California in September of 2001, where he found himself with a part time job working for the Friends of Santa Ana Zoo assisting with setup for Boo at the Zoo. This led to a wide variety of positions: working in basic maintenance for FOSAZ, selling food in the concession stand, working in and later running the gift shop, until he was promoted to the role of Manager of Operations, and then later Director of Operations overseeing not just the gift shop, but also the train and then carrousel rides. Hello again my friends, It has been quite a while since I last wrote one of my journal entries but there are so many exciting things happening I just had to get back on to give you some updates! As a guest at the Zoo you have probably spent a lot of time enjoying one of our premier habitats, Amazon's Edge with its beautiful waterfall. This habitat is home to a variety of animals, including our howler monkeys, crested screamers and black necked swans. Many special events have been held at Amazon's Edge from Weddings and photo shoots to one of our most memorable auction items from Zoofari many years ago, the "Date to Mate" overnight experience. Unfortunately the viewing deck has been falling into disrepair, and was closed for a while to have the roof removed. The water pump and filtration system needs to be replaced, the water basin needs some attention, a very long list of items was put on the table. Then, a very special announcement was made that makes my eyes absolutely swirl in eager anticipation and delight! People who know me well know I love weaselly types of critters (The scientific name for the family is Mustelidae). Back when I was around 19 or 20 I went on a road trip with a friend to pick up his wife who was going to school in New York, a nice long trip starting in California don't you agree? The plan was for the two of us and another of his friends to take our time and make all sorts of stops on the way, but we would up instead going pretty much full steam ahead, and the only stop we made heading there was a short visit with my friends father who lived in Virginia. We enjoyed an early dinner, and then went down to a nearby shopping center to get some supplies such as Red Bull, Mountain Dew and some No Doze caffeine tablets. It just so happened that there was a small pet shop, and inside I spotted the cutest little critters I had ever seen, and immediately had to go in for a better look! One ferret, so small and adorable simply had to see what I was. He (I was told all the ferrets in the shop were males) came up to me, sniffing with his head bobbing up and down and slowly in circles and started climbing on my shoe. Before I knew it he was up my leg and I was grabbing him in case he might fall. I picked him up to my face to get a better look, and his nose touched mine as he tried in turn to get a better sense of my scent. While all the other ferrets were busy playing with each other and the toys scattered around for him, this little guy spent the next 20 minutes crawling all over me, playing with my fingers and wiggling his way into my heart. I of curse knew that bringing an animal on the rest of the trip with us would have to count as one of the worst things I could do, but there was no helping it, and of course my friend encouraged me along, so there he was, our fourth passenger to keep us company on the long hours still awaiting us on the road. The name for my new friend was easy, when he sniffed at me or anything else of interest; he would pull his lips up over his teeth slightly and gave the impression of a snear. And so, Snear it was. Snear was a great companion for me over the next several years, and I miss him sorely. Through him I learned a lot about the other relatives in his family tree: Badgers, Weasels, Minks, Otters and so many more wonderful creatures. Working at the Santa Ana Zoo, I often dreamed of having one of our habitats filled with otters, so very like Snear in their curiosity and playfulness. I even remember once saying to a few people that if it would bring otters to the Zoo I would sell my truck to help pay for it! That was a long time ago, and while I keep dreaming of playful otters or a fierce badger running around in the Zoo, I never thought this was something that would actually happen. Now back to Amazons Edge and the needed repairs, the City brings up the possibility of bringing new animals to the habitat. 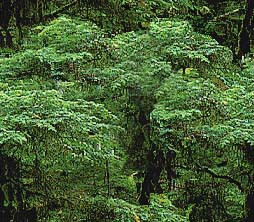 Over the years I have worked here there have been lots of ideas put forth about adding Jaguars to the habitat, putting bears out there, once I recall talk of an orangutan even. So I had to try really hard to keep my excitement in check when they started tossing around the idea of putting otters out at Amazons Edge. You may already know this, but when you have a large group of crows, they are referred to as "a murder of crows". I always thought that was kind of odd, if also cool, when I was young... I now can understand the reasoning behind this after my years here at the Santa Ana Zoo, and my experience from the other night can attest to why! Many times I will end up being one of the last people to leave the Zoo, especially if I am running a training session for one of our rides. On Friday I was leading a carrousel ride training for a few of our newer employees, and it wound up going pretty late. After the staff had all left for home and I had been sitting in my office for a while making sure I had all the signatures and whatnot that go along with the training I was visited by the urge of the call of nature. The carrousel has a couple of very nice trees around it, including a jacaranda tree which is particularly lovely during this time of year with it's lovely purple flowers which bloom very heavily and then fall and make a mess of anything underneath the branches of the tree itself. There is also an old tree which I believe is a type of maple and has for many years been struggling, with scraggly branches perfect for the setting of a spooky horror story, and today those branches were filled with crows. Not just a couple mind you, nor even a large handful. No, I was dealing with a full on murder of crows here with at least four or five dozen birds, staring down at me with their beady black eyes. Now I should mention, during the late spring and early summer the young crows are finally venturing away from their nests and testing their wings, learning to fly and fend for themselves. As any parent would be, the crows are extremely protective of their adventurous young, and in the past I have had several interesting encounters ranging from wonderful, like when I helped a young crow back into a tree to avoid a couple of local cats that were stalking it, to the downright scary and painful, like when I was dive-bombed in the back of the head by a super protective parent crow when I got too close to its young while walking in the amphitheatre. Fortunately this time there were no young on the ground, and the crows stayed in the tree, cawing away at me and following my every movement. Still, it was hard not to feel a little uneasy and of course what pops into my mind but a memory of watching the classic Hitchcock film "The Birds" in which our feathered friends suddenly started randomly attacking people. This is of course an extreme exaggeration, and I know as long as you give any animal the respect it deserves and keep a proper distance you will be fine but still, it was just one of those moments... These birds did not want to peck at me, they did not want to claw at my eyes. All they really wanted was to see if I was dropping any potential food on the ground. Recently I have been noted as having put on a little weight. OK a lot of weight... So after much sighing and bemoaning, I decided I need to start doing more walking, and of course, what better place to walk than the Zoo! For those of you who have ever gone through a weight loss routine, you have probably heard of the 10,000 steps, a daily goal to gauge your activity by. I found that on average, I was getting maybe 3,000 to 4,000 steps per day, and was curious as to how many steps I would get on one lap walking around the Zoo. So with this goal in mind, I set my little watch to count my steps and went off on my little trek! The first thing I have to say about walking through the Zoo for exercise is how interesting it is to see how the animals react as I go by. My dear friend Matteo was quite perturbed that I was not stopping to talk to him, though I did go back afterwards to have a little chat so I think he forgave me. In the Farm area, our Emu was excited by my walking, which I had forgotten from my early years when I would do an occasional jog to get from one area to the other how much she got a kick out of it, sometimes even trying to pace me as I would go back and forth running errands. I did not get to go into the aviary as it is closed while they are treating the water in the pond, but I did go by Larry, Curly, and Shemp, our resident Orange County Parrots and they were making bird calls at me, not unusual as they are quite the comedians. Next time I will have to bring a little weight to get more of a workout on my walk, but in any event I look forward to it. Weekends may be a little harder to get a good relaxing walk in, but if you ever have a chance to come to the Zoo on a weekday, and want to get in some care-free exercise this is one way that sure seems to be enjoyable to me! Early today I took a few moments to walk over and say hello to one of the Zoo's more recent additions, a little anteater baby. This is the third anteater born at the Santa Ana Zoo, and the first male which has the staff very excited! Our Zoo Director Kent Yamaguchi even named the new anteater Jimi, after his sister-in-law. I was surprised to see that the mommy and baby were allowed into the main part of the exhibit today as previously they were being kept in the smaller side yard. For the safety of the baby, we the zoo keepers have to make sure that the daddy is kept separate, as he can get very excited and might accidently hurt the baby so he was in the side yard today instead. I spent some time trying to get a couple of good pictures with my phone, watching the two exploring the exhibit area, baby comfortably riding on his mommy's back which he will continue to do until he gets to be pretty big, maybe even half his adult size! (I am glad I was not giving my younger brother piggy back rides when he was that big! Well, at least not for more than a few minutes at a time...) I managed to get a couple pictures that came out OK but the mommy was not being very nice to me, staying on the far side of the exhibit and changing sides each time I went over to where she was much to my frustration. A couple families came by while I was running back and forth in my poor attempt pretending to be a photographer and musing on about what it would be like if I had a real nice camera with a good zoom lens, and so I had fun pointing out the baby as I put away my phone almost successful in convincing myself it was the phone behind my poor shots, not any lack of talent. The children loved seeing the little guy on his mommy's back like that, and one of them and then one of the parents started reading facts, and when she exclaimed how the anteaters' tongue can be as long as two feet the kids eyes got so big I could not help but smile. Next to the FOSAZ office is a lovely little garden area that was started by our Office Manager Vanessa. Between the two of us and a little help from Steve, our maintenance guy, our garden has really thrived. Today as I was out watering the garden, I was visited by a sweet little hummingbird. He seemed very interested in the water that was shooting out of the hose onto a small tree on the other side of a chain link fence, so I held the stream as steady as I could to see what he would do. Slowly, the hummingbird flew closer and closer, hovering between advances, seeming to gauge the waters flow. Suddenly he zipped into the spray at the far end of the stream and then to a branch nearby, using the water that had covered his body to have a little bath! Finishing up with the water he had collected in that quick moment, the hummingbird left the branch and began hovering again near the water stream. I thought my little friend might like it if the water was not so harsh, so I aimed the stream up above so I was hitting the branch of a larger tree that was hanging over the original tree I had been watering. The hummingbird almost immediately took to the resulting spray and droplets falling like rain, delighting me with a show as he perched in the smaller tree, fluffing his feathers and having a good and thorough bath for around two minutes! Tonight we had a very special event at the Santa Ana Zoo: Dream Night, where children from Make-A-Wish come with their families to enjoy a private night with the animals. The event is held after the Zoos� normal hours and the staff volunteers their time for the children. In the past Dream Night was held in conjunction with the Zoos' holiday event in December, but this has always led to a lot of families not being able to bring their children because it is so cold and often rainy during that time of year. This year we held the event during the summertime and it was a great success! One of the added bonuses of holding Dream Night in the summer is how late it stays light out. That gives people a better chance to see the animals, and gave me a chance to say hi to one of my favorite monkey friends, Mateo the crested capuchin! Mateo recognizes several of the staff at the Zoo, myself included. When he sees one of us, he will come running to the front of his exhibit and make a territorial display usually followed by a more friendly bonding call. During the evening I went by his exhibit several times and the guests got a real kick out of watching our interactions and had a lot of questions regarding his behavior and if he really did recognize the staff. While it would never be safe to go into the exhibit with Mateo, (remember, he starts off doing a territorial display and that means he would be very aggressive!) I really love being able to spend these little moments with him. Tonight it was really special being able to share those moments with our Dream Night visitors. After an early morning meeting, and then going through around one hundred fifty emails to find only fifteen that are not spam, I decided a needed a little break and went for a walk through the Zoo about thirty minutes after opening time. I had not gone into our aviary in quite some time, so I thought this would be a good chance to stroll through and say hi to the birds. The aviary has always been one of my favorite spots. The lush green of the plants and trees, the small waterfall that greets you as you first walk in the entrance and the interconnected ponds filled with turtles and little Mosquitofish remind me of the creeks and streams I would play in growing up. Some of the birds such as the Scarlet Ibis and Roseate Spoonbill are very colorful and easy to locate as they tend to stay in the area around the pond nearest to the exit. Many of the other birds can be much harder to find, and turn every walk through the aviary into a real treasure hunt! As I approached it was clear they had gathered around one very naughty Red-eared Slider, one of the turtle denizens of the aviary. Since the animals have relatively free roam of the aviary, this little fellow had made its way onto the main path, and the children were petting its shell. Here I am left with a bit of a dilemma as it's not very safe for either the animal or the people for there to be contact like this, so I made a quick judgment call and asked the children to please leave the turtle alone as they were scaring it, and pointing out how you could tell it was scared by the way it way bringing its limbs in close to the shelter of its shell. I have to give the children and parents that were in the area credit as they were very polite and did as asked, and the parents reinforced that we do not want to scare the animals! Next I made a second judgment call and carefully picked up the turtle, stepping slightly off the path to place it closer to one of the ponds. This is of course not always a good idea as when you pick up any animal, it can mistake your action as being something very aggressive or potentially harmful and they may bite or scratch you in self defense! I have handled a few turtles in the past, and based on the behavior this turtle was showing I was confident I would not be getting bitten but please never try to handle any animal you are not familiar with, and even animals you have been around before you must always give the proper respect! The turtle now safely back off of the path; I finished my tour of the aviary. I would have liked to have spent more time but duty called and back to the office I had to go, plus I needed to wash my hands after handling an animal... Still, I had a great time visiting the aviary, and I hope a few people take some special memories home with them of a silly little turtle who had a little too much excitement that day! Today we held our annual Volunteer Recognition luncheon. This is a special day to thank those who give of their time to help make the Santa Ana Zoo a truly wonderful experience. The Zoo has around one hundred people that volunteer on a regular basis. There are the Docents who are education specialists that help with animal handling during events and animal shows and lead tours for school groups, Train Drivers who run the train ride alongside Friends of Santa Ana Zoo staff, Farm Monitors who help out in the goat yard area with cleaning and overseeing staff interaction with the animals, and a wide variety of volunteers from families and organizations that come to help out with many other activities. Each and every volunteer goes through special training depending on what area they are looking to volunteer for. The time demands can be heavy, but you would never know it from their smiling faces, and the level of dedication they give to the Zoo is incredible; in fact some volunteers have been a part of our family for over thirty years, and others drive over forty miles! And so to all these wonderful men and women I give you my thanks for all you give, not just to the Zoo, but all the families that visit. You are all an inspiration and I am so glad that once in a while I can take part in a little celebration for all your hard work. I hope you enjoyed the hot dogs! Aside from being surrounded by animals, the next best thing I love about working at the Santa Ana Zoo would have to be working with the guests. Today was a prime example of how wonderful it can be to play a small part in the making of a happy memory! It started to rain shortly after the Zoo opened. At first it was just a light rain, but quickly it built up for a real good drenching! As is always the case with bad weather days I am faced with a difficult question: do we keep the rides open and hope it clears up, or do we close down and send home our employees and volunteers? After discussing the weather reports with our two volunteer train drivers, we made the call to hold off sending people home, hoping that by noon it might be clear, and the tracks might be able to be dried enough that the train could make the full run without any slipping. With crossed fingers we waited. Sure enough just a little before noon, that sun started peeking out at us and after a couple of test runs we decided the train was safe to give rides! This couldn't have been better timed as there were around seventy school children who were very excited to ride the train, but what really stuck out in my mind was an older couple that I first got to interact with when I was doing a break for the carrousel. These two people had that infectious kind of smile, a truly sincere grin that seems to bear a light of its own. They asked if I would take a picture for them for which I was happy to comply, and then the ride began. The only riders at the time, they seemed to relish the moment. Each time they went by they would return my wave, that wonderful smile ever present. As the ride ended the carrousel operator returned from his break, and preparing to move on to my other break-giving duties I wished my two riders a wonderful day at the Zoo. Next on my agenda was to give my two volunteer drivers their breaks at the train. They were almost ready to do a run, so I took over the duties as conductor for the driver who would have been staying at the platform. The other driver was ready to take the train around, so I turned to address our guests, to find sitting in the middle car a very familiar pair of smiling faces! I spoke briefly with the couple before starting my traditional send off for the train, asking the guests to help on the count of three and then giving my extremely drawn out and rather boisterous and loud "ALL ABOARD!" As the train started off on its journey I waved good bye to the passengers, looking forward to seeing their smiles when they returned and thinking to myself how this time, we made the right call. We stayed open, and we played a part in making people smile. On Saturday April 20th the Santa Ana Zoo hosted Party for the Planet and Zoo-B-Que, our annual Earth Day and Membership events. In between my various duties of the day, I found myself in the back of the Zoo with a few lucky visitors watching Peter, our male Giant Anteater enjoying a nice bath in the pond. It was fascinating watching him roll around, kind of like a dog might do when taking a dirt bath. Peter splished and splashed, seeming very much to enjoy the water, but it was the very final moments before he went rushing off into the brush that had the growing crowd squealing with laughter. Leave it to nature to be free of the constrictions of public decorum, as Peter had an itch, and most assuredly, he did scratch it with great enthusiasm. The comment one of the mom's in the crowd made was perhaps the best quote I have heard walking around in the Zoo... "I'm saying it's a boy anteater!" Fortunately I think I managed to keep my professionalism on display, but that is one moment that I will be laughing over for years to come. 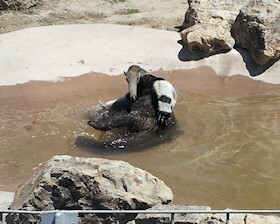 You just never know what you will be getting to see when you visit the Santa Ana Zoo! The other day I was helping with driving the Zoofari Express train ride here at the Zoo and had a really fun experience with some of the guests. A young boy and girl had noticed a little critter in the depot and were very eager to point it out to me. Lo and behold, it was one of the local swift lizards, or as I grew up calling them, blue bellies! Now I think lizards are one of the coolest things on the planet, and some of the behaviors they exhibit can be really neat. I have a bearded dragon that I keep in my office, and they have a special pouch under their jaw which they can flare out when they are frightened or nervous, and when they do that and open their mouths it is one scary little display! Fortunately, the swift lizard doesn't do anything so scary, but what he was doing is a version of a body pump or pushup. This along with head bobbing is used in displays for territorial disputes or attracting a mate. It was really neat having a chance to talk to some of our guests about these little scaled denizens that visit us here in the Zoo. Look around your neighborhood or your back yard and you may find one of these lizards lounging around on a rock, or maybe perching on a fence! Just remember though, if you decide to try and catch one, it may bite you as they are wild animals. Should you succeed in catching one, admire it for a short time, but then release it right back where you found it. That's all for now, but if you want to learn more about swift lizards, there are lots of cool facts you can find online. 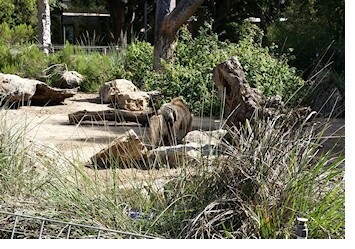 Have fun, and I hope to see you at the Santa Ana Zoo soon! One of the things I love about working at the Zoo is that even though I am not in a department that works directly with the animals, I still get moments where I have special viewing times and even hands on experiences with some of the wonderful animals that call the Santa Ana Zoo home! Yesterday for example after a long grind at the computer and one cup of coffee, two sodas and three small cups of water, I made my way over to the main Zoo office to visit their facilities for those who need to go. 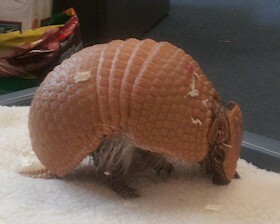 Low and behold however that one of the Zoo's newer additions to the education staff, an eleven month old armadillo who recently completed its first show during the Zoo Birthday was in the office for a little getting-to-know-the-staff time! Not being one of the actual animals on exhibit this is a rare treat as all of the educational animals are housed in a separate area, and I couldn't help but to take a moment to pause and look with a big grin on my face at this amazing creature. What struck me as the most fascinating thing about the armadillo has to be the design of its front claws which are perfectly adapted for digging through the soil. I also enjoyed watching as it scampered around and noted how it used its front nails for support rather than the palms of its fore-feet.